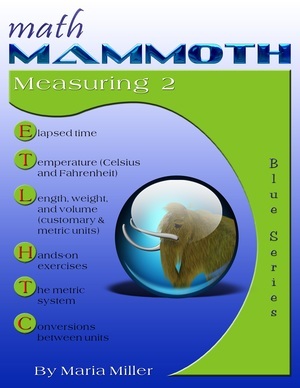 Math Mammoth Measuring 2 - elementary math workbook for grades 4 and 5. Download and print. 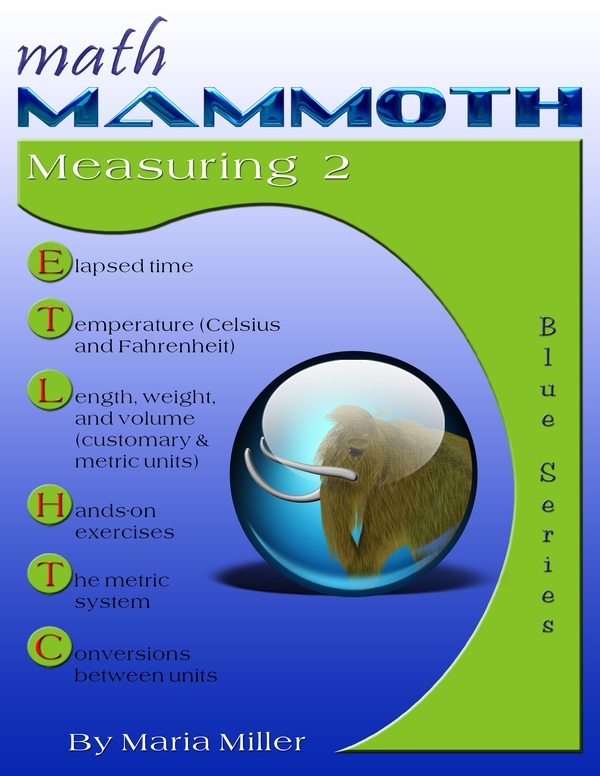 Math Mammoth Measuring 2 is a worktext that covers time, temperature, length, weight, and volume related lessons, aimed for 4th-5th grade. The focus in these lessons is no longer on the actual act of measuring (as was the case in earlier grades), but on calculations that involve conversions between different measuring units. In the lessons about time, the students get to do fairly complex calculations concerning hours and minutes. In lessons about temperature, the students are introduced to negative numbers and even get to do a few simple calculations with them. The units are named consistently, with the same prefixes (milli-, centi-, deci-, deca-, hecto-, and kilo-). These prefixes and their meanings are not commonly studied in detail in fourth or fifth grade; instead they are typically studied in 6th grade or later in conjunction with scientific notation. You may at your discretion, explain them to the student even at an earlier time. The last three lessons deal with using decimal numbers with measuring units, such as expressing 0.7 liters in milliliters, or converting 3.4 miles to miles and feet. These lessons are better left for 5th grade. In these lessons, the symbol of a calculator next to a problem ( ) means that students are allowed to use a basic calculator to solve the problem.